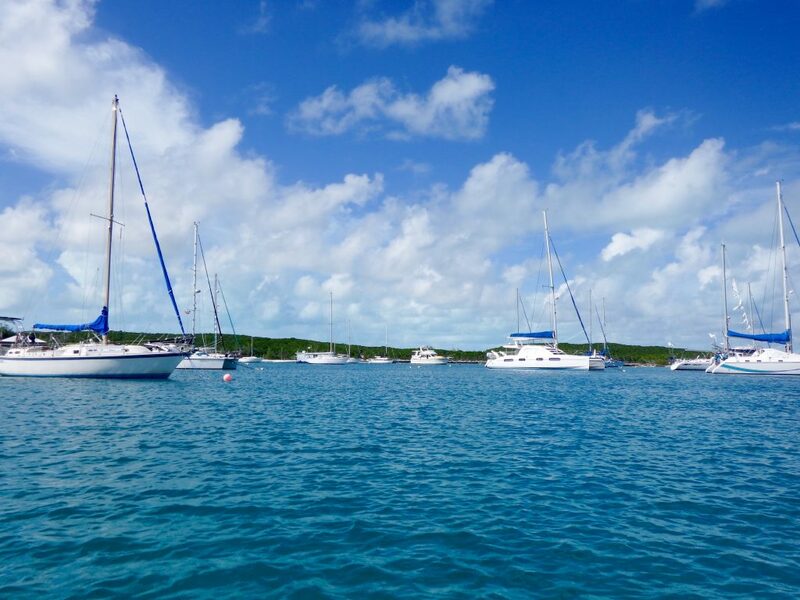 With our dinghy motor nonfunctional, on 11/24/16 we left Cambridge Cay at 0950 and at 1200 dropped the anchor at Big Majors Cay, next to Staniel Cay. As usual on this trip, we were one of very few boats in the anchorage. In a month or two, this large anchorage will be crowded. It’s a very popular stop, both for cruisers heading south and for those who like to stay in this area for weeks or longer. The anchorage is huge and well protected from all but westerly winds, with a few smaller nearby anchorages for wind protection from the west. There are three very small grocery stores, two in small rooms in private homes and one on the first floor of a private home. Another advantage of stopping here is there is an airport, so often cruisers will have their guests fly into Staniel Cay. Also, with the airport being walking distance from the marina, it’s a good place to have boat parts or other supplies shipped from the States. (In Georgetown we have to pay a $30 fee to a broker who drives to the airport to pick up packages we have sent from the States and brings them back to town where we pick them up.) There are several restaurants, including the recently updated Staniel Cay Yacht Club. The town recently added a laundromat. 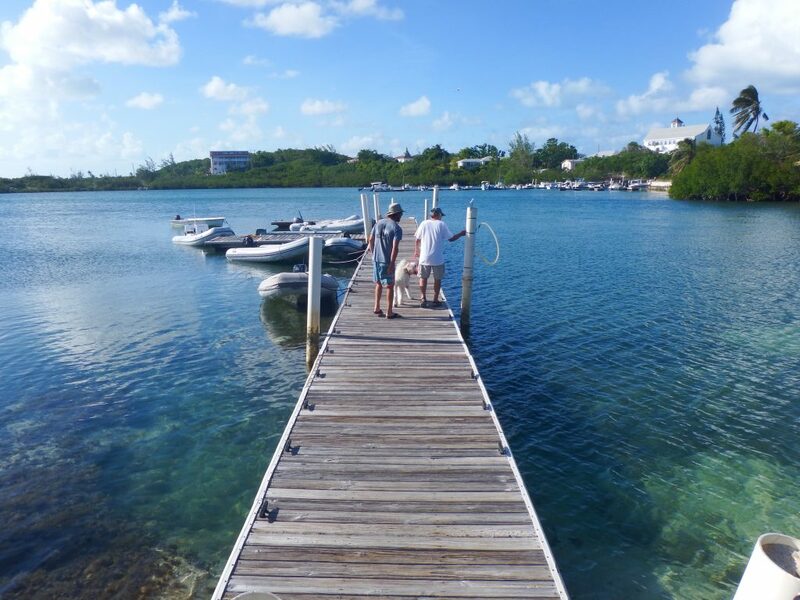 Water and fuel are available at the marina and dive boats take tourists to nearby snorkeling and diving locations. 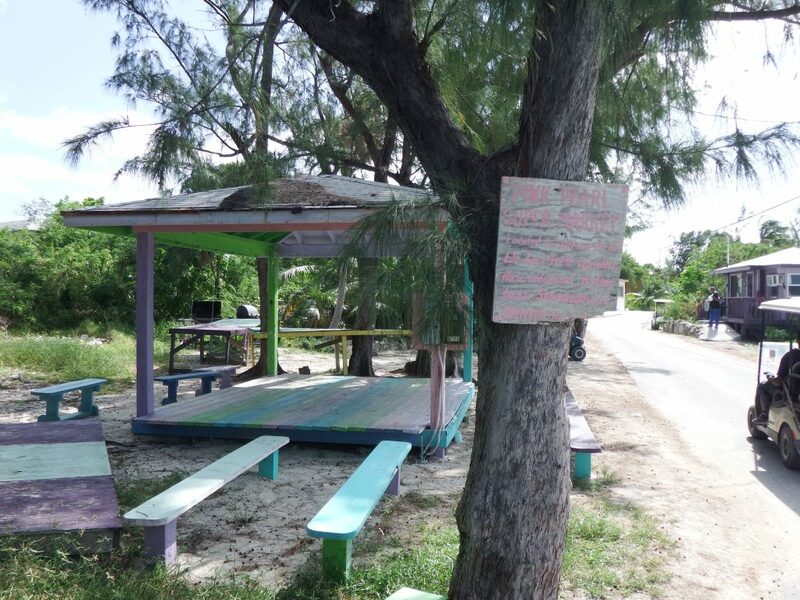 There are quite a few cottages and private homes for rent on Staniel Cay. 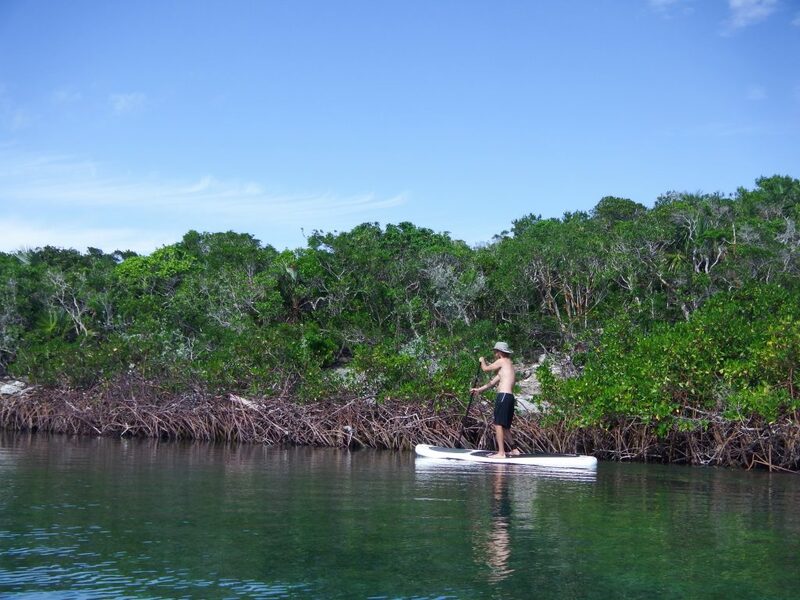 Cruisers can base themselves here and with a short sail or motor be at the popular Exuma Land and Sea Park. First on the agenda was to repair the dinghy motor. Mark worked on it for several hours, finally determining that the problem was the fuel. He emptied it from the motor and it looked more like water than gas. He added new gasoline and the motor started. Off we went to see the swimming pigs and take Sailor to the beach. We needed to wait until the next day for a slack tide during daylight to go into the Thunderball Grotto and snorkel. People actually come from all over to see these pigs, which is quite amazing because a pig farmer from Iowa once told us that all pigs can swim. Although there are quite a few beaches on Big Majors Cay, the pigs are always on this one. We chuckle when we see float planes or tour boats coming here from resorts all over the south and central Bahamas and as far away as Nassau to see the pigs. 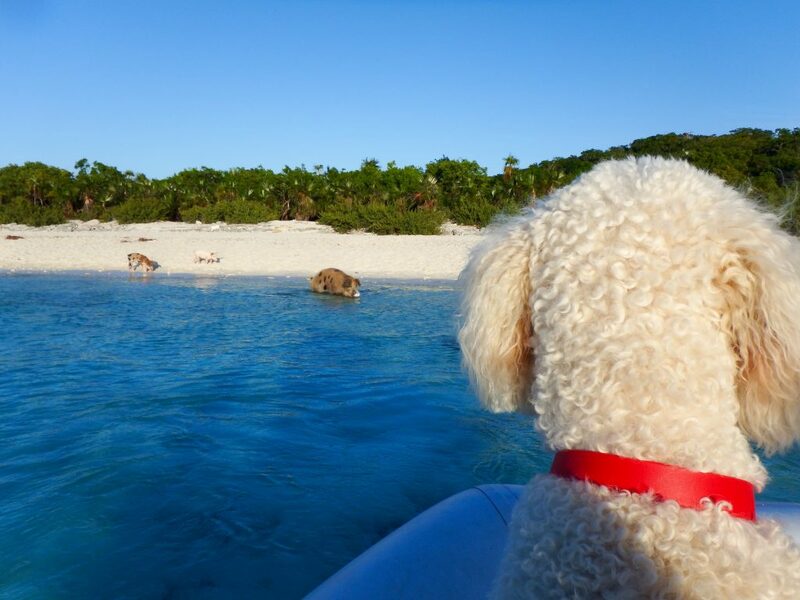 They pull up to the pig beach, the tourists get out and swim with or feed them, they get back in their plane or boat and head off to the next “attraction.” We usually stop our dinghy when passing this beach, but have never gotten in the water with the pigs or gone ashore. Sailor, of course, would love to play with them, but that would be dangerous. These are huge pigs and they are protective of their piglets. Apparently, these pigs are so important to tourism in the Exumas that as Hurricane Matthew approached Big Majors Cay in October, the piglets were captured and placed in sheds while the larger pigs were left to fend for themselves. With the strength of the hurricane force wind, the piglets could have blown away. Next we took Sailor to another beach on Big Majors where he could run, swim, and fetch his ball. 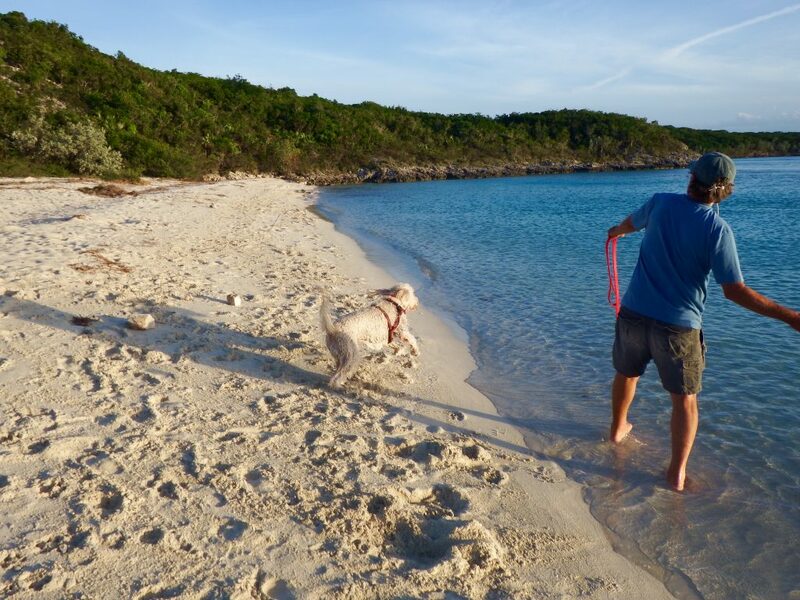 We can almost always find a deserted beach in this anchorage where he can freely run without dodging people. He hadn’t been off the boat since the fiasco on Bell Island the previous day when we were marooned for awhile. This was much more fun. My son, Peter, climbed a nearby hill but the rocks were very sharp so he didn’t go far. The next morning, we moved Seas the Day to an anchorage right next to the grotto so we wouldn’t have a long dinghy ride to snorkel or go to lunch. Our motorsail to our next stop at Cave Cay was short, so we could easily get there in the afternoon after spending the morning in Staniel Cay. Last year when we snorkeled Thunderball Grotto, it seemed like there weren’t many fish and the coral wasn’t as colorful as in the past. We blamed it on the massive amount of people in the grotto making it difficult to swim around to look at the coral. Everyone times it to come during one of the two slack tides during the daylight hours. Otherwise, the strong current pushes through the grotto and makes getting in and out difficult. Like the pig beach, tour boats bring tourists to snorkel at the well known Thunderball Grotto where scenes from the James Bond movie Thunderball were filmed. This time, again there were several dinghies anchored outside the grotto (the dinghy mooring balls have disappeared), but it wasn’t as full as last year when we came. Swimming into the grotto, it was very apparent that the tourists who come here in large groups have killed the coral and scared the fish away. I spent several minutes inside and returned to the dinghy since there was little to see. Mark didn’t go in the water because he had a cut on his foot and there are a lot of sharks, mainly harmless nurse sharks, in the area. Peter ended up snorkeling mostly around the back of the outside of the grotto where few people go. All in all, I don’t think we’ll go to Thunderball Grotto again. It’s sad that the multitudes of tourists have ruined it. I don’t include cruisers in this because they have been coming here for many years, before the influx of numerous daily tours began, and until a few years ago the coral in the grotto was very healthy. Our first time snorkeling here was in 2010 and the grotto has changed drastically since then. In the past, there were so many fish in the grotto than they would sometimes totally surround snorkelers. Most cruisers are very careful to protect the land and sea environment so they know to be careful not to touch live coral. Peter used his GoPro camera at Thunderball Grotto, but hasn’t put a video on YouTube yet. Hopefully he captured some colorful live coral outside of the back of the Grotto. He saw a nurse shark while swimming there. Below is a video Peter took when we snorkeled at The Aquarium, near Cambridge Cay, at our last stop. 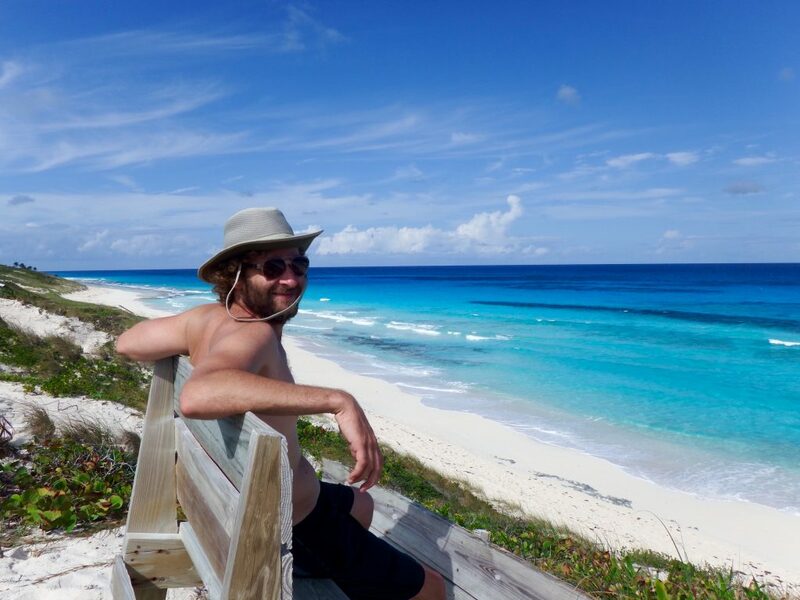 This is in the Exuma Land and Sea Park which is a “no take” zone, so it’s as pristine as the coral is going to get here. There were still plentiful, wide varieties of fish in The Aquarium. 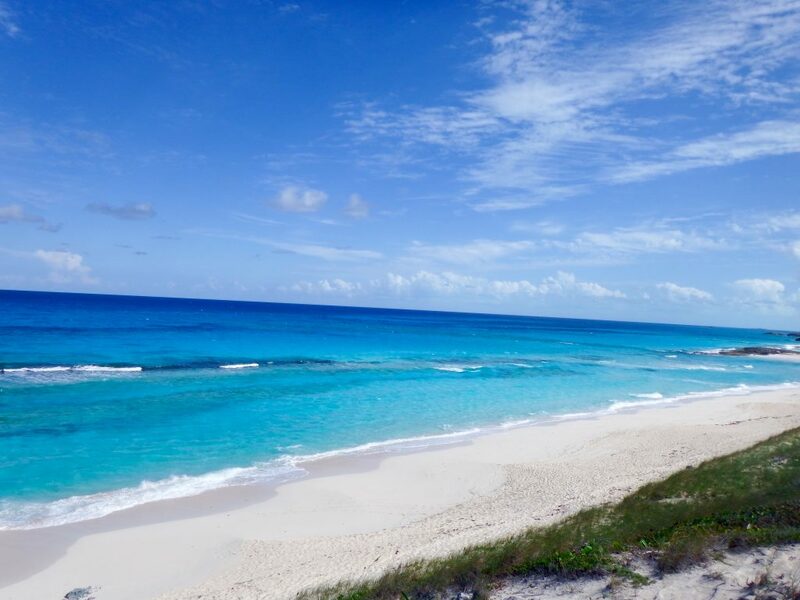 However, several nearby islands are owned by private citizens, including Johnny Depp and the Aga Khan, and they have been dredged for megayachts which will probably affect the nearby cays in the Park. I suspect they allow their family and visitors to take shells off their beaches, so while they are in the Park, the “no take” rule isn’t being followed. 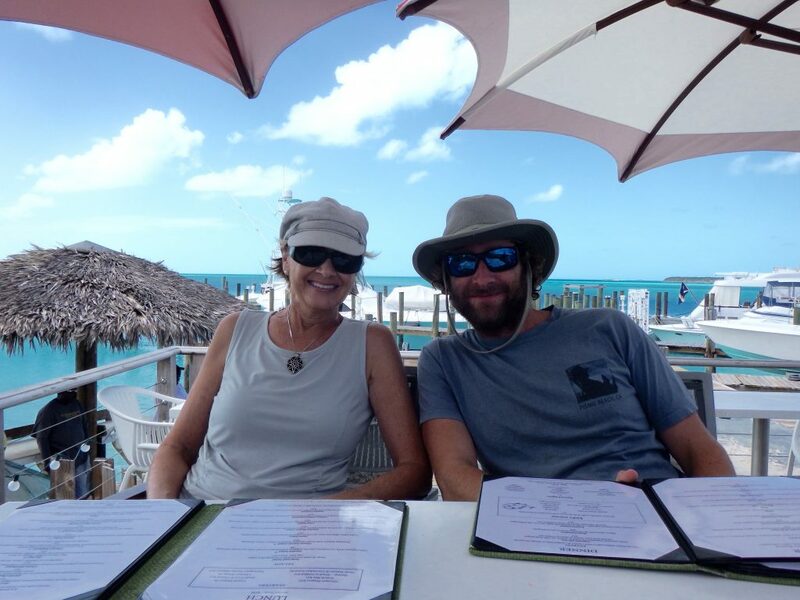 We returned to the boat, cleaned up, and went ashore to Staniel Cay where we had a delicious lunch at the Yacht Club and took a walk around the town. Lunch at the Yacht Club. 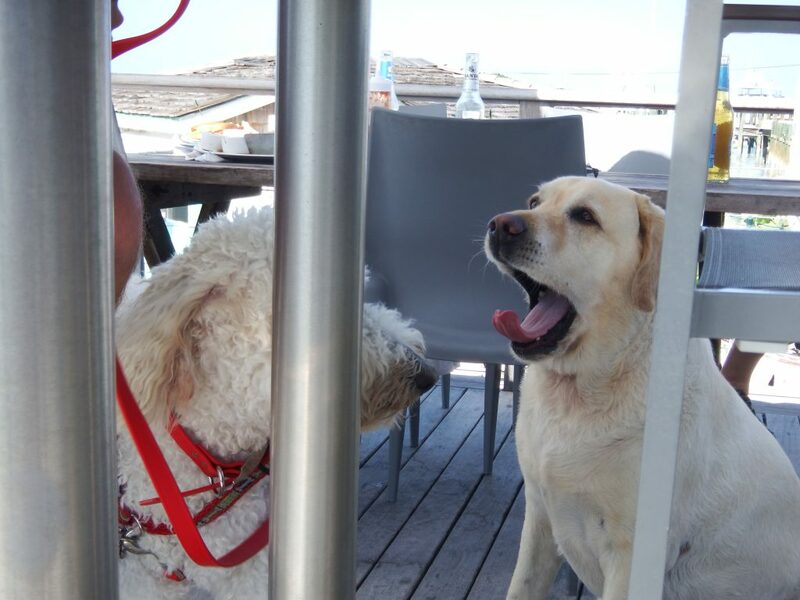 Sailor and the resident Yacht Club retriever had a discussion below our table, probably about food droppings. There are signs telling people not to feed the dog, but he is quite clever. We were eating outside and I noticed he would wander over and walk under the tables from time to time. He seemed to know he would find food that had dropped off the tables, and he did! Sailor doesn’t eat “people food” so the dog got any scraps that blew off our table. Perhaps Sailor was telling him to feel free to eat any scraps he found. 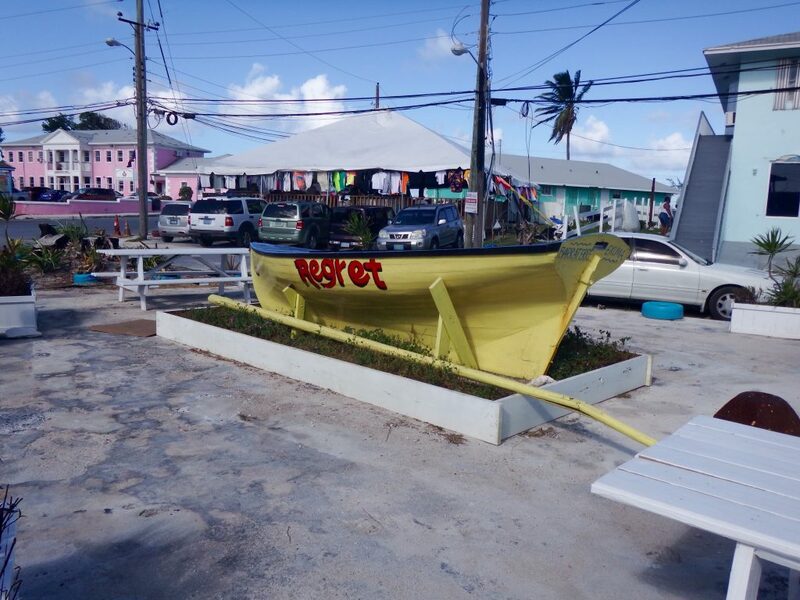 Whenever the Staniel Cay residents have a fundraiser for a local cause it’s held in this location. The food is always traditional Bahamian cuisine including BBQ meat, peas and rice, mac and cheese and coleslaw. 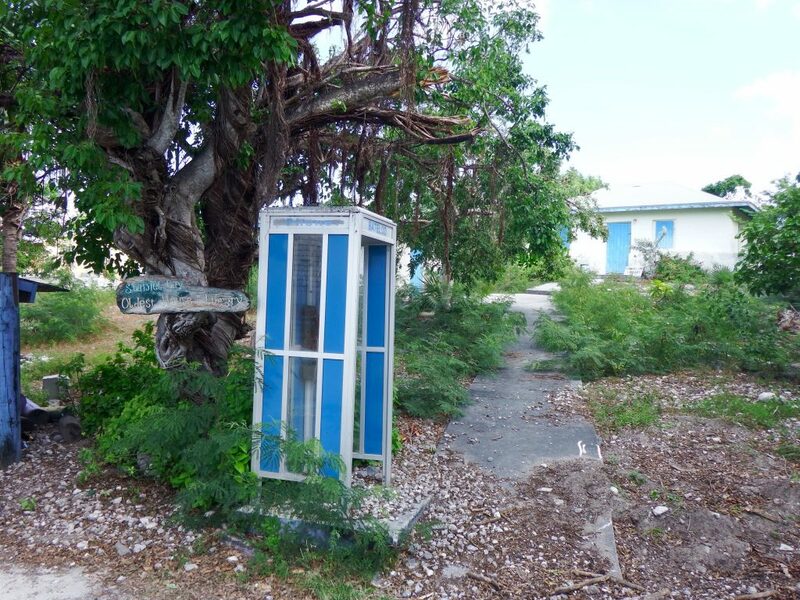 Before cell phone towers were built on most of the islands, you could get a phone card and make calls back to the States, or locally, from one of these booths. Now Batelco (Bahamas Telephone Company) has cell towers everywhere (except in the Land and Sea Park) and voice and data prices are reasonable. This phone booth hasn’t been used for awhile. Coming back to our anchored boat near the grotto, we were all alone again. 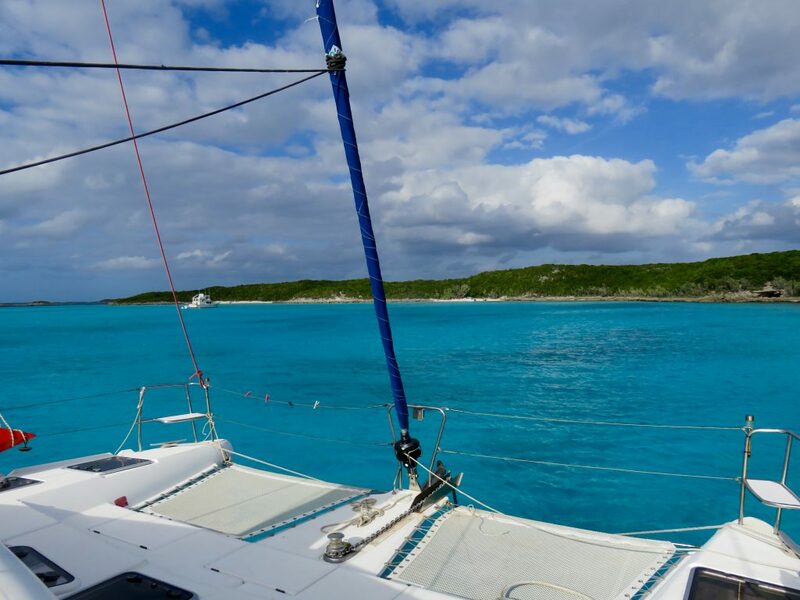 We pulled up the anchor and made our way to Cave Cay. We had asked Chris Parker during his morning SSB/webcast what the sea conditions on the Exuma Sound would be like the next day between Cave Cay and Georgetown and he said the wind would be 10-12 kts and seas would be 4 ft becoming 3 ft. That sounded fine to us so the plan was to leave for Georgetown in the morning from Cave Cay Cut. When we arrived, there was one other catamaran anchored near us. We didn’t go ashore, although there is a nice beach right around the corner from this hill. 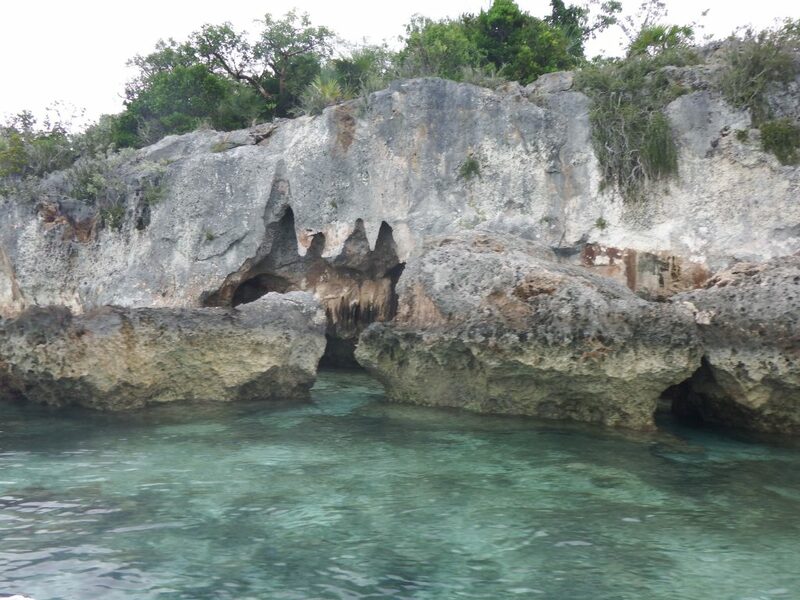 You can see why this is called Cave Cay. Below is one of the many caves along the shore and there are more on the land. The next morning, we waited until 0900 to leave, hoping that since it was close to slack tide we might not encounter large seas or a rage as we left through the cut. We were anchored near Galliot Cut but motorsailed the short distance to Cave Cay Cut, which we find is sometimes easier to go through. But it wasn’t. As we entered the cut, large waves were coming onto the foredeck and crashing over the salon roof, which was not unexpected since it’s always been rough when we’ve gone through these cuts, but we assumed once we got through the cut and turned south, the predicted 4 ft waves would be manageable. They would have, except Chris Parker didn’t mention the HUGE SWELLS. The four ft seas were on top of them. We were going straight into the swells and they were still crashing up onto the foredeck, occasionally coming over the salon roof. Mark estimated the swells were 10 to 12 feet high. From another direction they would have been manageable because if there is enough time between the swells, they just carry the boat up and then gently drop us down. Not this time. I went to bed with Sailor and Peter got in his bed with a dramamine while Mark was at the helm, controlling the boat as best he could. 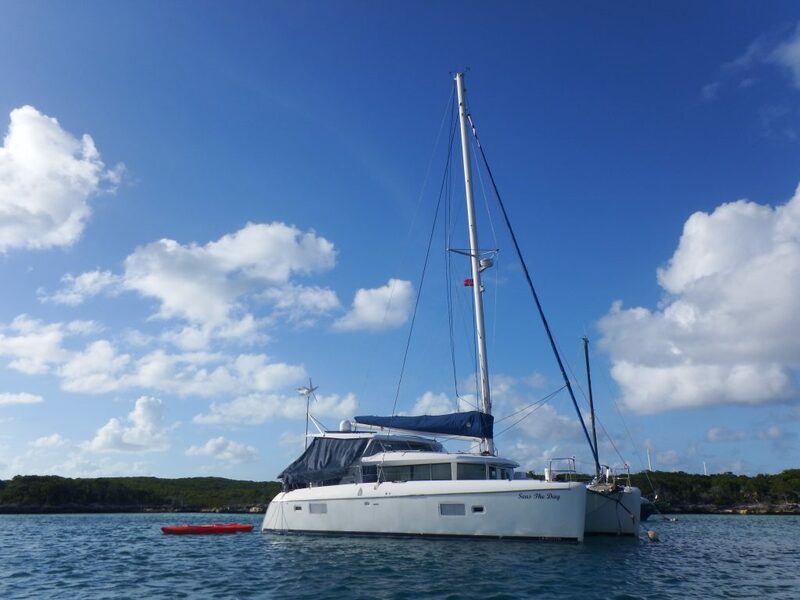 Many people think it’s easier in rough seas to be on the deck level, but on our catamaran, I find it’s more comfortable in beds located in the hulls. Besides, Sailor is a “fair weather sailor” and insists I get in bed with him if the sea is not almost flat. These sea conditions were probably the worst ones we have ever sailed in over the last eight years. At 1417, about five hours after leaving Cave Cay, we were in Elizabeth Harbour and dropped the anchor near Volleyball Beach on Stocking Island to wait for high tide to get into the mooring field on our ball. The seas dropped as soon as we entered Elizabeth Harbour although it was still very windy and the water was choppy. While this was a horrendous leg of the journey to Georgetown, we know that Seas the Day can take much more than we can and we weren’t worried about any danger to us or the boat. The Ohio State/Michigan game began shortly before we entered Elizabeth Harbour, so we had to finish watching that, which went into several overtimes. We lived in Columbus, Ohio for over 20 years, so Peter and I are diehard Buckeye fans. A few minutes before the game ended, we lost our Direct TV signal, so we had to check online to find out that Ohio State won. 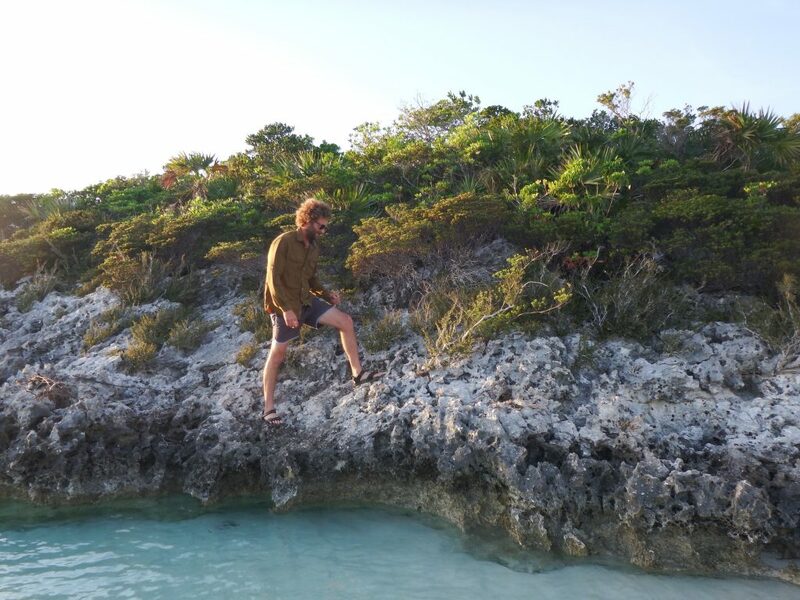 Before we left Cave Cay, we had removed all items off shelves, locked all cabinets, moved cockpit plants to protected areas, and put away everything we thought might fall because it’s almost always a little rough on the Exuma Sound, aka the ocean. However this time anything that was loose fell down. We have hanging rods for clothes in the two showers that we don’t use and these had never come down in the roughest of seas. Not only did they come down with all the clothes, the rods bent in the middle and will have to be replaced! A planter in the cockpit that had never moved fell down causing loose dirt to blow all over the cockpit. Except for the hanging rods, nothing broke, but it was the biggest mess we ever had to clean up. Below are pictures of the mooring field in Hole 2, and Seas the Day on her ball. Most of the moored boats are empty, with owners storing them here during hurricane season and not arriving for the cruising season yet. When Hurricane Matthew passed over Georgetown in October, several boats in this mooring field and the “hurricane hole” next to it, broke loose and hit the sharp rocks on the shore, causing major damage. The mooring balls, which are held by screws dug deep into the floor of the mooring field, did not break loose, but the lines from the boats to the balls did. In one case, a boat came loose and hit other boats, pushing them along with it to the shore. Peter had a few days to explore Georgetown before he flew home to California, but the wind was high so all we got in were a ride around the relatively calm mooring fields on the stand-up paddleboard and kayak, a walk on the Exuma Sound beach, a trip into town for a short tour, a snorkeling attempt in the harbor, two dinners at St. Francis, and a game of Texas Hold’em the night before he left. It was too choppy in the harbor to get in anymore snorkeling or exploring. We’ve never seen the dinghy dock in Lake Victoria, where cruisers tie up when they come into Georgetown, so empty. Then again, we arrived here over 1 1/2 months earlier than on our other five visits to Georgetown. Sometimes we were the only dinghy on the dock. In a month, dinghies will be three and four deep along this dock. In the dinghy dock photo below you can see Mark and Peter are getting water from a hose to fill a bowl for Sailor. 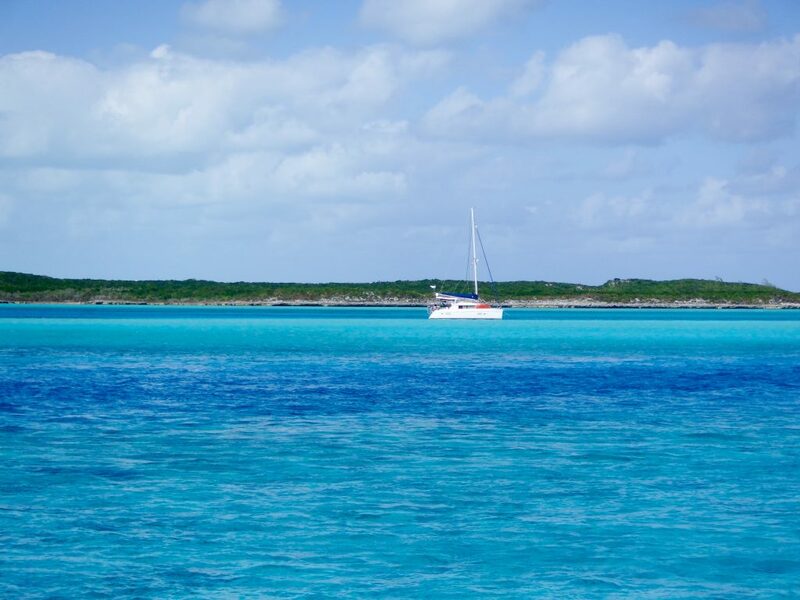 This is the only place in the Exumas where there is free RO (reverse osmosis) water for cruisers available directly into their dinghies. 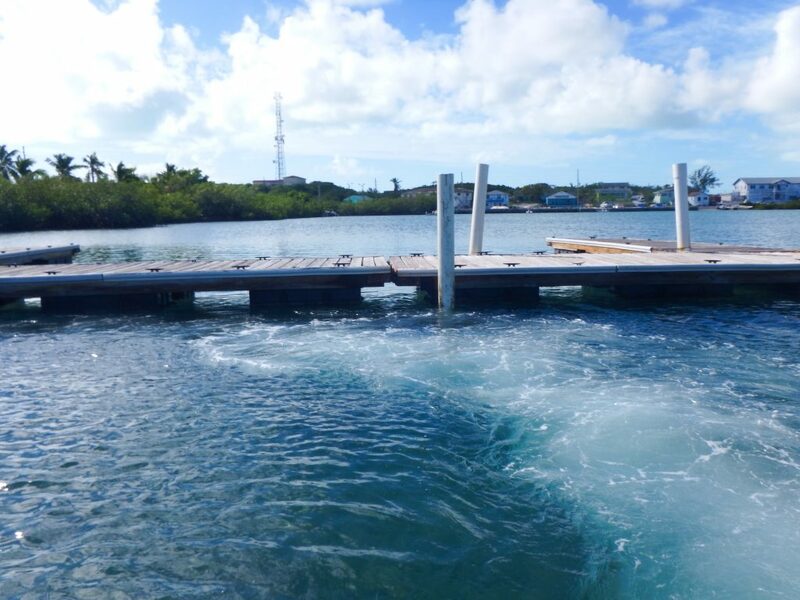 Water usually costs about 50 cents a gallon at fuel docks and marinas in the Bahamas. The Exuma Market, located next to the dinghy dock (which was built for cruisers by the Market), provides this free water. As more boats arrive in the harbor, there will be a line of dinghies with jerry jugs waiting to get water to bring back to their boats and put in the tanks. We have a watermaker so we make our own RO water, but once our watermaker broke and while waiting for a part we were very grateful for this free source of water. Shortly before we arrived in Georgetown, we heard news that the Red Boone Cafe had burned down. 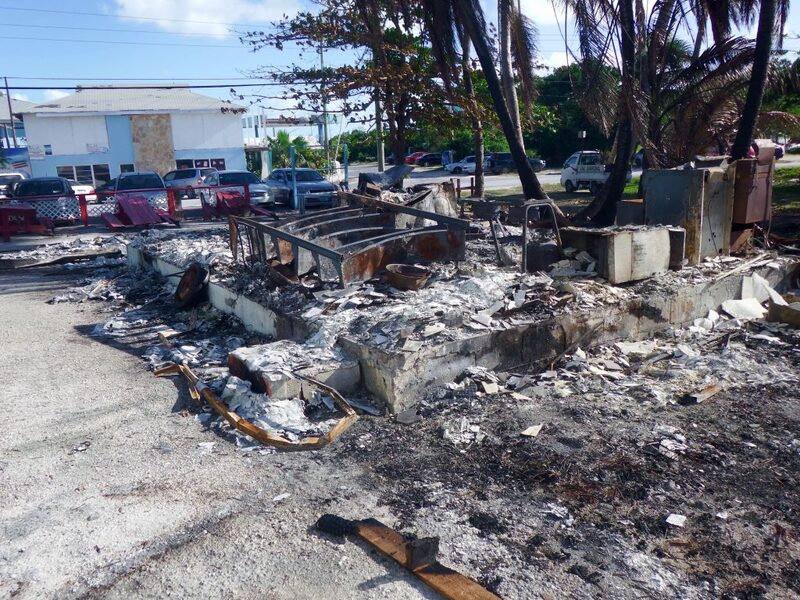 The building is next to the Exuma Market, so it was amazing that did not catch fire. Fortunately, a large propane tank used by the cafe, not shown in this picture, did not catch fire and explode. This was a very popular place for cruisers to get together for something quick to eat and to visit. I believe they also had free wifi. The three red picnic tables near the cars, always occupied by cruisers and locals, are now partially burned, showing that is where the fire stopped. Hopefully it will be rebuilt and used as a cafe again. The Georgetown School is near the center of town. 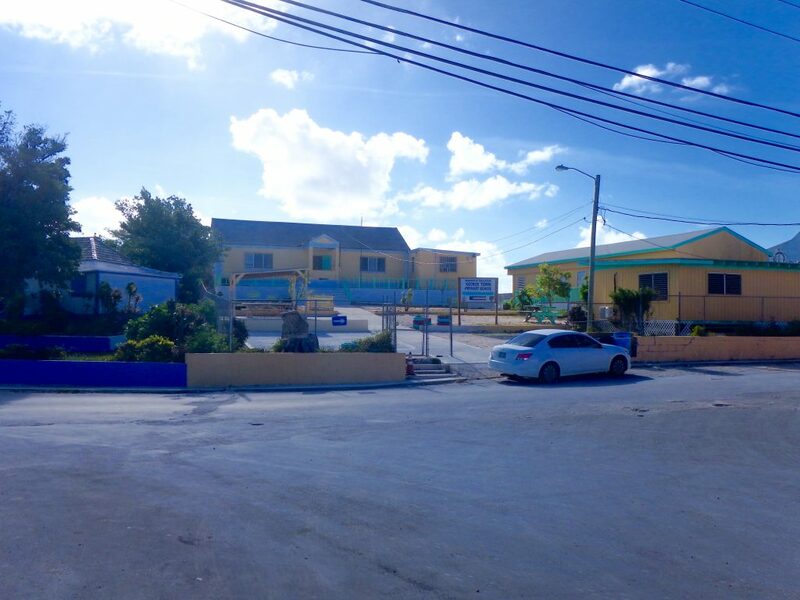 In the Bahamas, all schools are painted yellow. Government buildings are pink and police stations are aqua/green, The islands in the Exumas do not have high school classes, so students have to move to Nassau and live with friends or relatives when they attend high school. I don’t know the significance of this boat, although I suspect it won a regatta for Georgetown. Next to it is the Georgetown Straw Market. This burned down in April, 2015, but is up and running now with a variety of locally made treasures. The only thing I could talk Peter into letting me buy him was a small refrigerator magnet with a map of the Exumas on it. It cost $6 and I suppose I could have bargained down the price, but I always figure these ladies need the money much more than we do, and gladly pay whatever they ask. The wind finally calmed down enough to go for a kayak and iSUP ride. We stayed in the “Holes” aka mooring fields, where there weren’t any waves and we were protected from the higher wind in the harbor. This photo was taken in Hole 3, which is a hurricane hole, and boats are on mooring balls or tied to docks. No liveaboards are allowed. 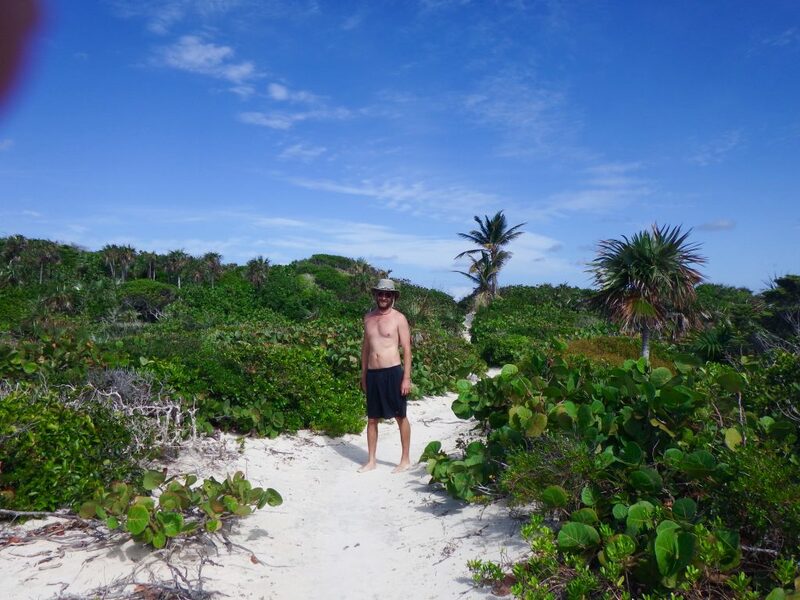 We took the kayak and iSUP to a small beach in Hole 1 and walked over the hill to the beautiful Exuma Sound Beach. It’s amazing that there is so much foliage left after Hurricane Matthew’s wind went over The Exumas. A climb to the top of a sandy hill where there is a bench gave us a great view of the beach below. It is almost always either empty or at the most has a few people walking or swimming. 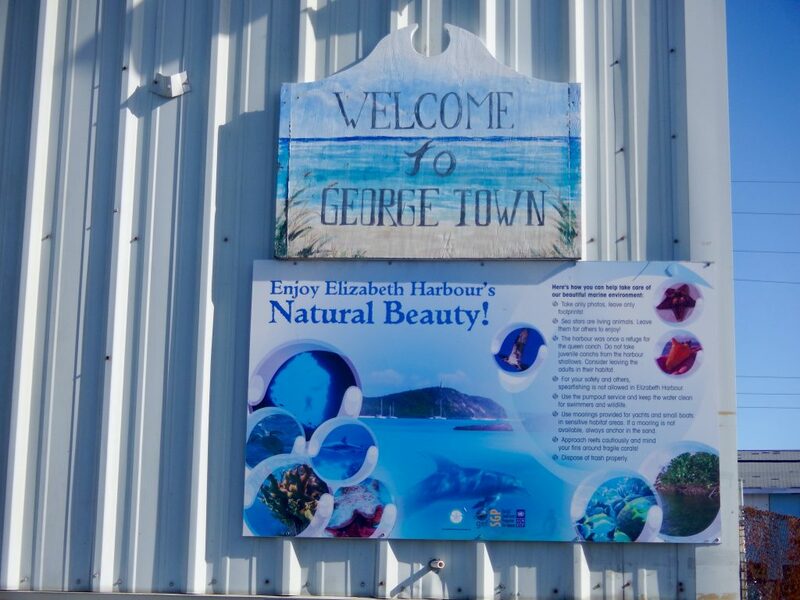 All the action is on the Elizabeth Harbour side Stocking Island and across the harbor in Georgetown, so many cruisers and tourists never discover this treasure. Hopefully the tour boats don’t start coming here! We plan to stay in Georgetown until sometime in April, when it will be time to start heading north to eventually return to our home port of Stuart, FL and our favorite marina, Sunset Bay. 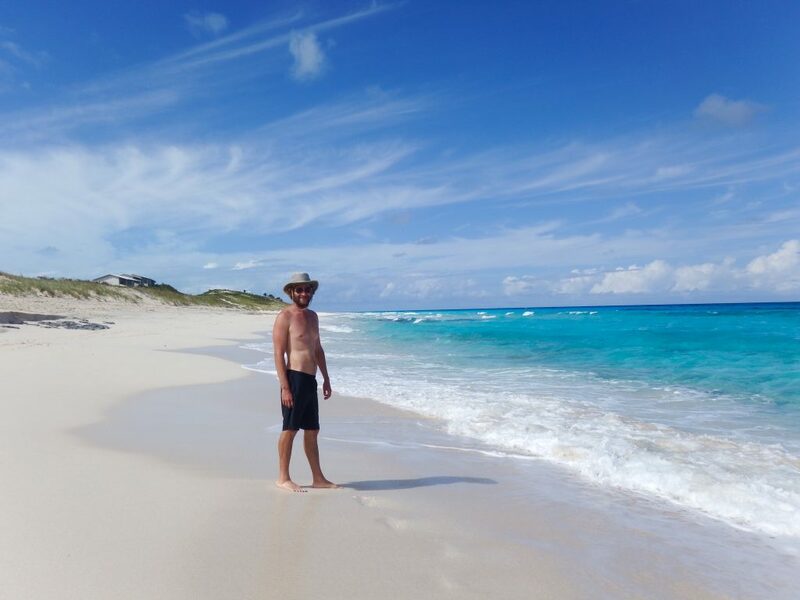 This entry was posted in 2016-2017 Bahamas Cruise and tagged Bahamas, Big Majors, Cave Cay, Elizabeth Harbour, Exumas, Fire, Georgetown, Hole 2, Hurricane Matthew, Kayak, Snorkeling, Staniel Cay, The Aquarium on December 15, 2016 by Jan.
To enlarge any photo, click once. Click again to zoom in.